I’d like to offer you today this beautiful Vintaj handcrafted St. Zelie Rosary! I believe that Saints Louis and Zelie Martin (the parents of the Little Flower) are very powerful for the problems of Family Life….that they will be added to that list of patron saints for the married! This rosary is a lovely reminder of that holy wife and mother, St. Zelie! Just leave a comment here, a cheery hello, and your name will be added to the hat! It is always great to hear from you. Sign up to receive Finer Femininity posts and you will get your name added in twice!! Is the time to trust Him too. He will make thee clean within. When in His dear name you plead. Trust Him for the blessing too. That with this life will close. The sun goes never down. The battle fought and won. 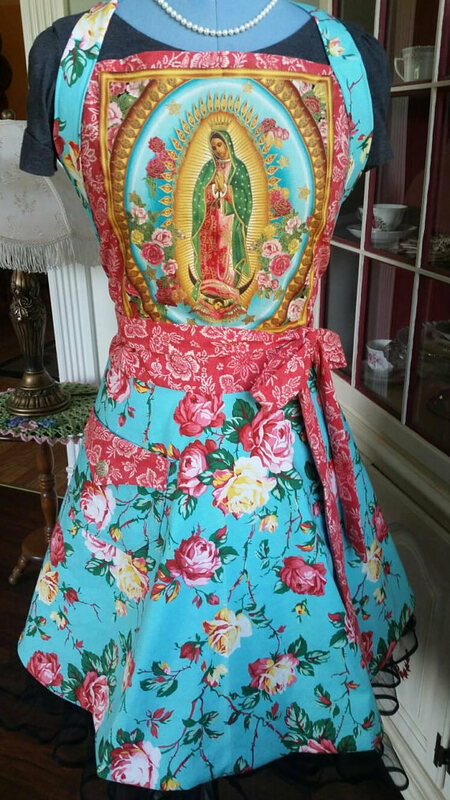 Unique and lovely, these aprons make great gifts for those wonderful women in your life! Available at Meadows of Grace Shoppe! Your blog is a little slice of beauty and encouragement in this crazy world. Thanks, Mum! Just discovered your blog, great pictures. Hello, and God bless you! Thank you for your blog! It is a continual source of encouragement and inspiration. Love St Zeilie. I was thinking about her the other day and having a home-based business, since she had one. Beautiful site! Oh wow, that is such a lovely rosary! And we need the mother saints now more than ever! St. Anne, St. Zelie, St. Gemma, St. Elizabeth of Hungary, St. Brigid of Sweden, oh holy blessed Virgin Mary, pray for us! Correction, we need all of the saints for this battle.